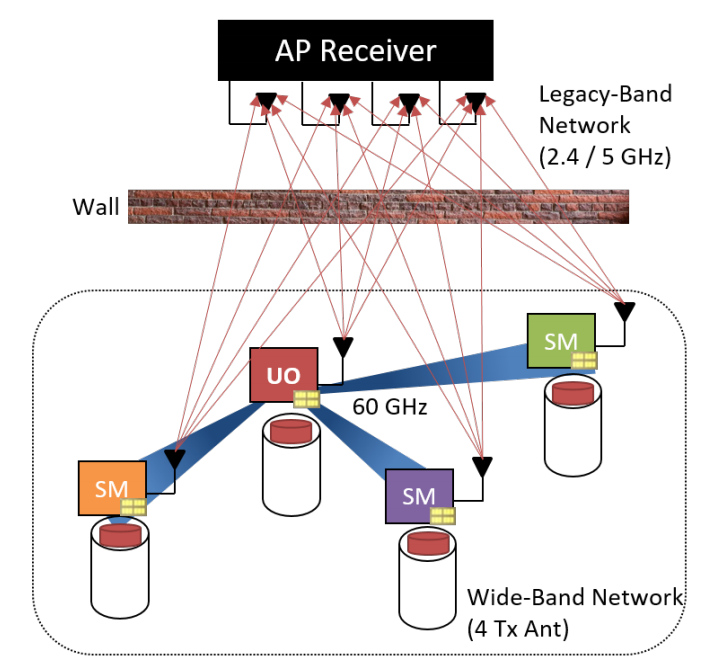 We introduced a diverse spectrum architecture which enables a legacy band virtual array where multiple single antenna clients transmit simultaneously, thereby spoofing an unmodified AP to infer it is communicating with a single client with multiple antennas. Our architecture transparently couples antenna arrays in the legacy band and millimeter wave band, such that mobile devices use millimeter wave band to form a short range, wide band network to synchronize and share data, enabling multi-stream transmissions in legacy band with single antenna clients forming a virtual array. 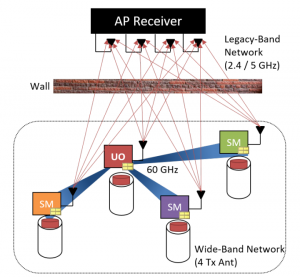 We further designed a client PHY and MAC layer that coordinates the independent clients to enable uplink spatial multiplexing in order to spoof reception at an unmodified legacy AP. In particular, the design introduces three distributed PHY processing blocks that allow a client to operate from SISO to any MIMO configuration despite having single antenna in the legacy band. Participating clients can assume two roles in a particular transmission in our design. There is one “Uplink Originator” (UO) node which distributes its data to (M-1) “Spatial Multiplexer” (SM) nodes using mm-wave network. 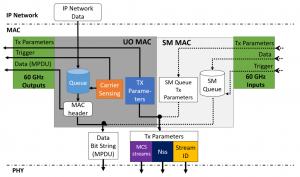 The SM nodes then perform frequency and protocol conversion on the data of UO to enable M simultaneous transmissions in uplink in the legacy band. 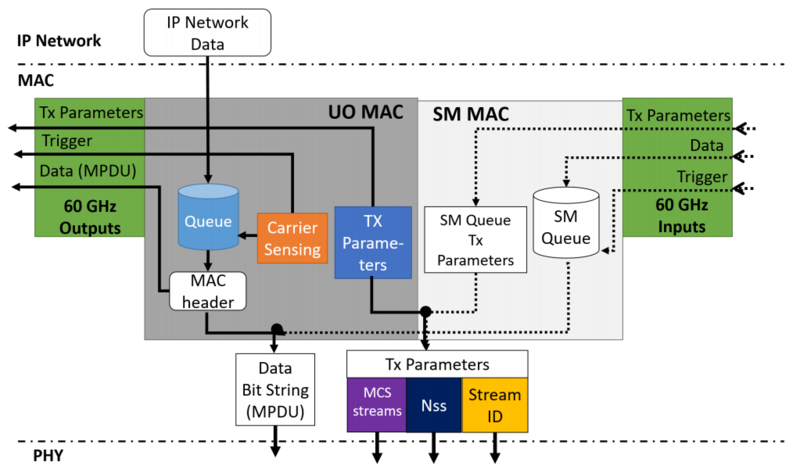 Moreover, to ensure that clients’ 802.11 medium access is unmodified, we introduced a multiplexer block in SM nodes as a part of MAC design, which acts as the remote partial-replica of the MAC layer of UOMAC. This spatial multiplexer block ensures that the SM’s medium access and protocol stack is unchanged while giving the UO remote control over medium access, acknowledgements and retransmissions. Finally, we implemented our design on a software radio platform, WARP, which enables Over The Air (OTA) experiments. We developed evaluation platforms for both legacy and mmwave bands in hardware. For the legacy band, we use off-the-shelf 2.4/5 GHz 802.11n receiver with a maximum of two streams. Whereas for clients we integrate our PHY design with 802.11 implementation for OTA transmission and receiver processing. For mm-wave band, we use VubIQ transceivers operating in 58-64 GHz unlicensed channels with 1.8 GHz bandwidth.